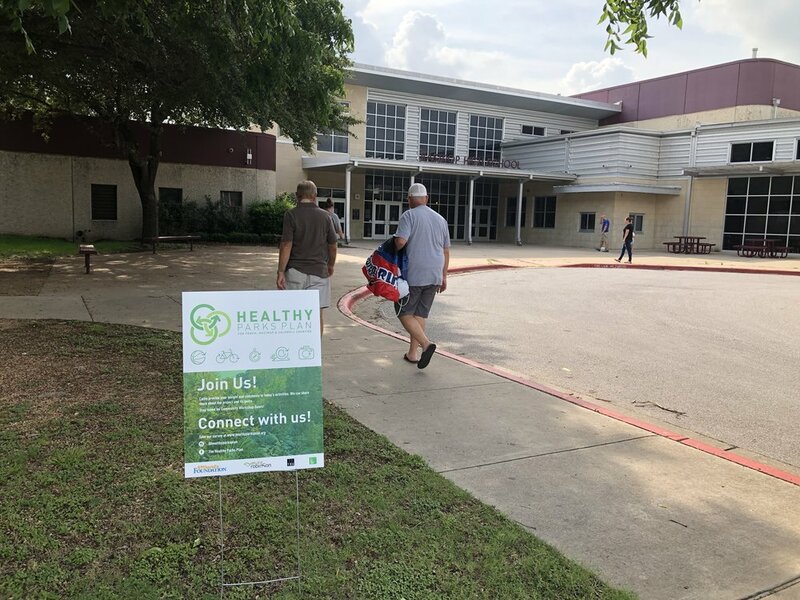 The Healthy Parks Plan for Travis, Bastrop, and Caldwell Counties began its Community Engagement in January 2018 and will conclude in early 2019. 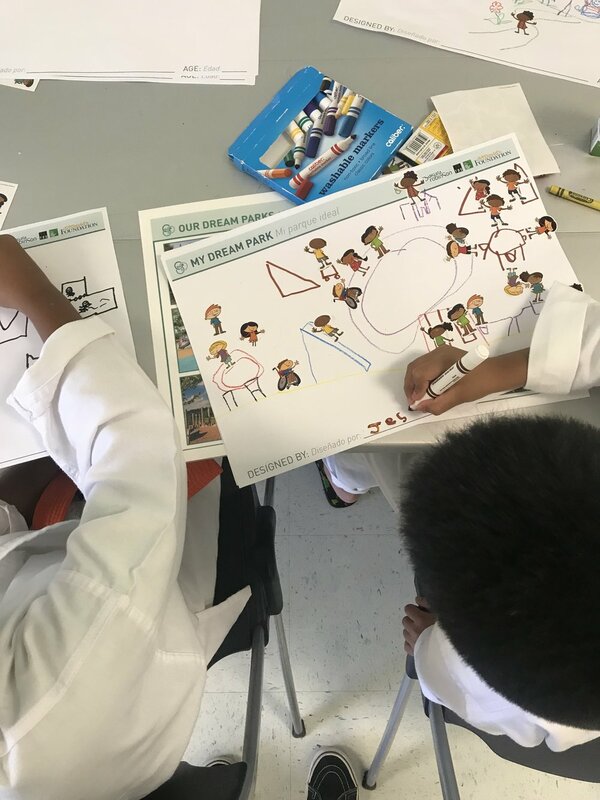 The Healthy Park Plan kicked off its first phase of community workshops, which consisted of five workshop locations, from June 18-25, 2018. The workshops are one part of a multi-faceted engagement effort for the Healthy Parks Plan. Other opportunities include tabling at community events, an online survey, phone poll, in-person surveys, and interviews with local experts. Outreach preceded each workshop and aimed to reach as many residents as possible in the communities adjacent to and invested in the workshop locations. Flyers, social media posts, and postcards were shared with local institutions, community leaders, and partner organizations. From left to right: (1) Instagram images were shared with partner organizations. (2 and 3) Postcards in English and in Spanish were passed out at community events and shared with partner organizations. (4 and 5) Flyers advertising the workshop locations and times were shared in English and in Spanish. Mental health through connecting with both nature and other people in the community. Big Question #1: What gets you to go to the park, or what keeps you from the park? Big Question #2: What activities or features of a park influence your health? Big Question #3: What do you do to maintain a healthy life and what are your biggest barriers to maintaining a healthy life? 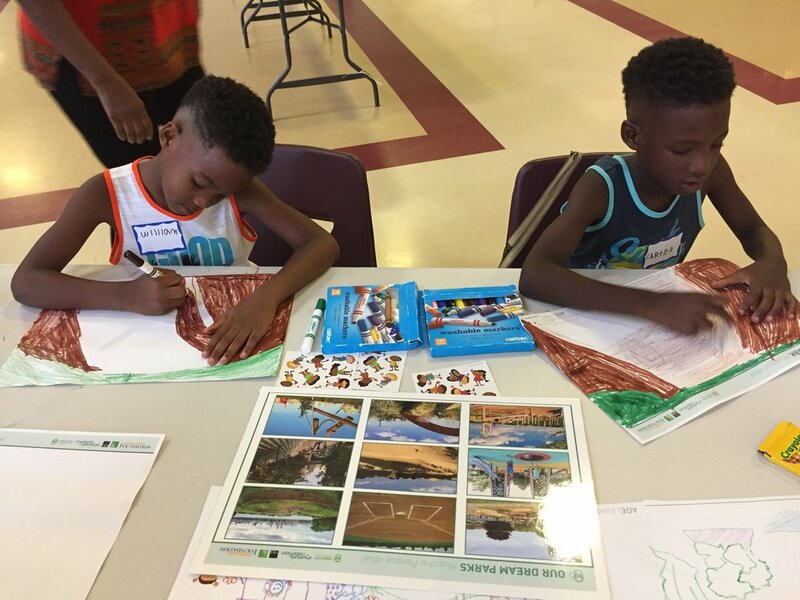 The second overarching goal of the Healthy Parks Plan Community workshops was to empower key stakeholders throughout the region to take ownership within the public engagement process. Established venues with strong community ties. The following aggregates the feedback from the five community workshops, conveyed into five overarching principles. Healthy parks include a variety of amenities for all ages and abilities, with trails and athletic fields being the most mentioned choices from participants. Shade and trees are the top requested need for existing and future parks. They increase participants’ activity level in parks both through their physical and emotional impacts. Water and natural landscapes help participants’ relax, unwind, and find peace within parks. Many adult participants cited children and children’s activities as their main reason for visiting parks. Community events and programming are highly valued as main attractions for participants. Activity description: This station was designed to gather input and insight from participants about their perceptions of the many elements needed to make successful parks. The prompts are situated along a spectrum that starts with “basic needs” at the far left and ends with “big ideas” on the far right. Activity description: This station is designed to gather input and insight from participants about their physical and non-physical barriers within parks. The station prompts participants to self-determine park concerns and divide their answers into three categories: quality of the park, amenities within the park, or safety of the park. Resulting themes: Participants identified cleanliness and maintenance as the main concerns related to park quality. Fitness and play equipment were the most highly requested park amenities. Most participants noted that supervision would increase the perception of safety in parks. Activity description: This station was designed to gather input and insight from participants about their perceptions of major health concerns, ranging from personal health concerns all the way up to family and community concerns. The station had two opportunities for feedback: the first was a private questionnaire to be inserted into a comment box and the second was a public facing board where participants could publically share their responses. After commenting on their primary health concerns, participants brainstormed ways to address these concerns. Resulting themes: Participants generally agreed that physical health, such as obesity, high blood pressure, and diabetes, were problems that their community faces. Many expanded on mental health, such as street, social isolation, and depression. When asked to think of ways to improve health locally, the many participants believed that increasing the number of activities and programming would be the most effective intervention. “More family and community based activity in place of family counseling”. “Reduce the fear so more families will feel safe in a park”. “Healthy eating is more expensive than unhealthy foods”. Activity description: This station was designed to gather input and insight from participants about their perceptions of existing park programming, and what features would influence their health. The station used aerial images of miscellaneous parks, with their features labelled, and question prompting participants whether the park’s programming would influenced their health, community connection, and relaxation within the park. Sports programming influence park users’ health the most, with baseball receiving the highest number of references. Water features and activities help users relax within parks, with natural bodies of water receiving the highest number of references. Trails and sport amenities were identified as amenities that would help them to be more active. Community events and sports provide opportunities for park users to connect with their community. Activity description: This station is designed to gather input and insight from participants about their physical and non-physical barriers to parks. 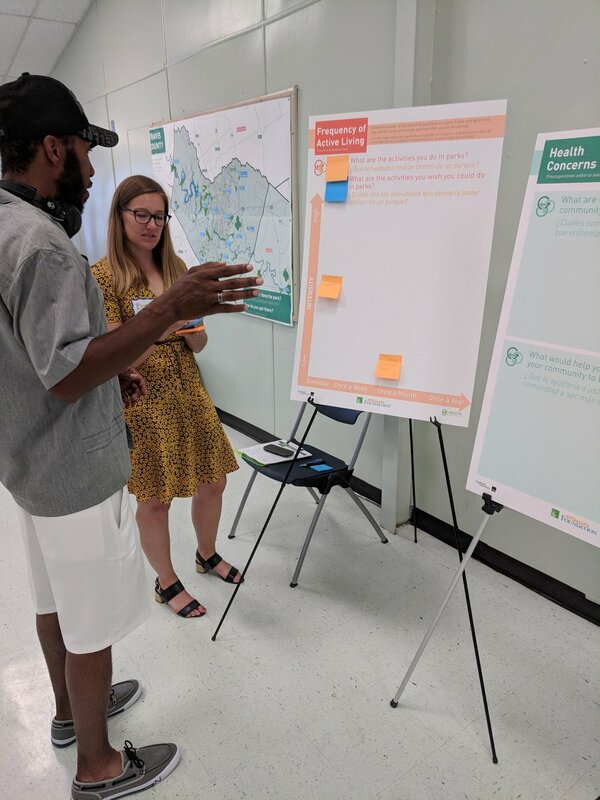 The station prompted participants to discuss how they get to their favorite park, and what issues they may experience along their route to the park. 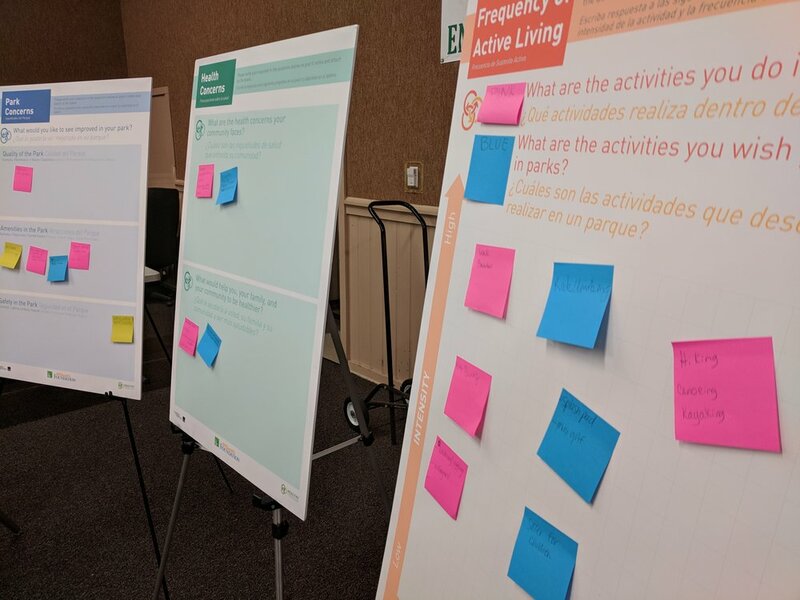 Resulting themes: When asked about their favorite parks, many participants immediately listed small neighborhood parks and open spaces that were easily accessible to their home rather than larger regional parks. When prompted to think beyond their immediate neighborhood, many participants from Travis County listed numerous regional parks. In more rural areas, participants seemed to have fewer interactions with our regional parks system. It was clear that participants felt more connected to the smaller parks they interact with on a more regular basis. 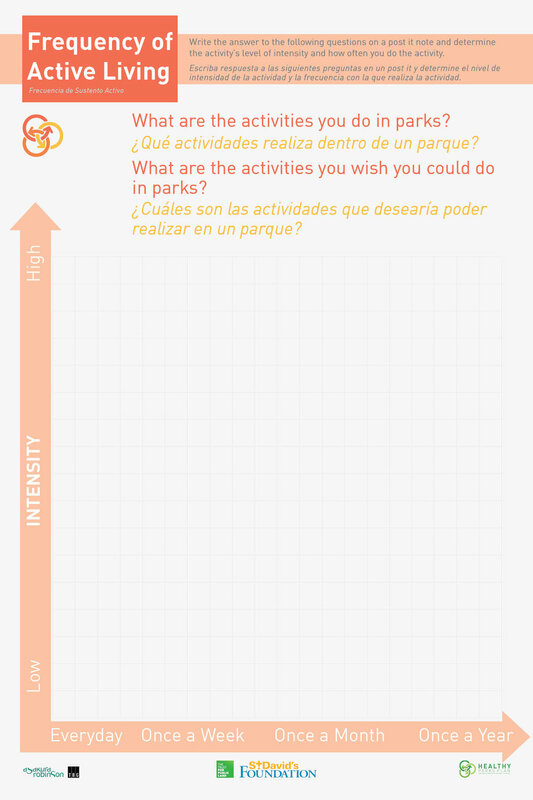 Activity description: This station is designed to gather input and insight from participants about how they choose to be active in parks, and how often they do these activities within parks. The participants self-determined their activity’s level of difficulty and how frequently they choose to do the activity, performing this exercise for both their current activities as well as activities they would like to do in the park but cannot. Resulting themes: Participants currently participate in sports and water activities, which are conducted frequently and at a high intensity. Other participants use trails and recreation facilities, like picnic tables, at a lower frequency and lower intensity. Meanwhile, participants desired additional types of sport and recreational activities, with pools and event spaces highly requested, as well as other sports and recreational activities such as bike parks, rock climbing, and mini golf. Activity description: This was intended to be a fun, creative activity allowing children to contribute to the plan. Participants were provided drawing tools and stickers to make small scale park designs based on their own “dream park”. Participants were asked why they chose their park design, allowing them to elaborate on what they like in a park. Resulting themes: Children ranging from 6-12 years old identified open spaces and sports fields as a main priority in their park design. They desired to play a variety of sports, play with their friends and family, and run around. Numerous children also drew slides, playgrounds, and trampolines.